APOPO & EWT Detection Rat workshop in Dar es Salaam, Tanzania. 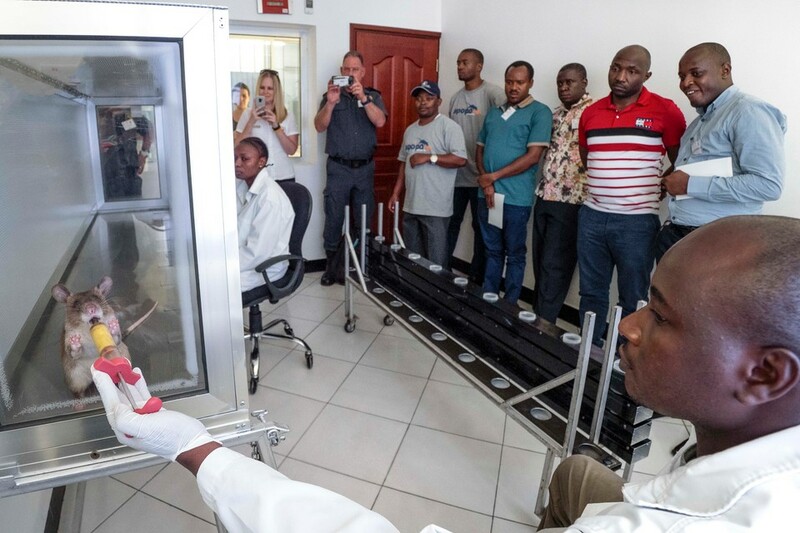 In partnership with the Endangered Wildlife Trust (EWT) Wildlife in Trade Programme of South Africa, APOPO hosted a Detection Rat Workshop to showcase the detection skills of the African Giant Pouched Rats, in Dar es Salaam December 3-5, 2018. Funding for the workshop was provided by the US Fish and Wildlife Service (USFWS). Workshop attendees at APOPO rat detection lab, Dar es Salaam. 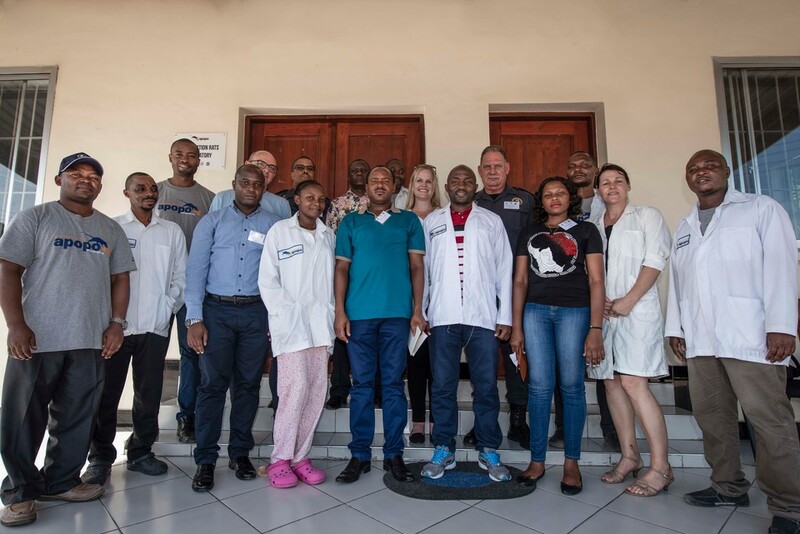 Results of APOPO’s proof-of-principle study examining if our rats can be trained to detect wildlife contraband were shared with the group at the workshop. This project was developed in recognition that international sea ports are known routes for smuggling large volumes of wildlife. These ports represent a particularly challenging environment for law enforcement officials as current methods of screening shipping containers are expensive, time consuming, and potentially disruptive to port operations. The aim of the project is to test a novel detection system suitable for the port environment – using African Giant Pouched Rats! Ten rats were successfully trained to detect two wildlife targets: 1) scales from the world’s most widely smuggled mammal, the pangolin, and 2) an African hardwood that is frequently logged illegally (Dalbergia spp., commonly referred to as ebony). APOPO rat detection demonstration, Dar es Salaam. The project consists of four main parts, the first is the proof of principle to determine whether the rats can, in fact, be trained to detect the smell of wildlife products. At the recent conclusion of this phase, the rats worked in teams of two to find 100% of the pangolin samples and only miss one hardwood sample across a total of 120 target samples among 1000 total trials! If this laboratory trial reflected the real-world setting, it would mean the rats searched 1000 shipping containers and correctly stopped 119 of these containers with illicit wildlife products. Perhaps equally important, the rats correctly rejected 99% of the 880 non-target odor samples. The very low false alarm rate is especially impressive when considering the inclusion of highly desirable food stuffs (such as peanuts) as non-target samples. That is, our rats showed incredible restraint to not be pre-occupied by or otherwise react to the presence of food. Overall, the rats responded correctly on 97% of the trials. Feasibility 1: Can African Giant Pouched Rats find new target specimens? We introduced new samples of pangolin scale and African hardwood to the rats. Impressively, the rats found 50% of the new pangolin samples the very first time they encountered them and this detection accuracy rapidly improved so that by the second evaluation session, there was no noticeable difference in detection accuracy across the two pangolins! Finding the fresh hardwood samples (compared to the treated hardwood the rats were trained with) took a bit more training, but the rats showed they were also able to detect these new samples. This means that if the rats are deployed to work in a port, they will be able to detect any pangolin or ebony, not only the specific individual samples they were trained to detect. Feasibility 2: Can African Giant Pouched Rats sniff out hidden wildlife products? Currently, we are evaluating how skilled the rats are at finding the wildlife targets when they have been “hidden” in a mixture of non-target “masking” substances (e.g. a pangolin scale hidden in coffee beans). This phase of the experiment will address another aspect of operational feasibility by providing information about how much pangolin or hardwood must be present in a shipping container for the rats to find it. The results so far are very positive. Feasibility 3: Can African Giant Pouched Rats work effectively in an operational environment? To properly inform this study, we recently hosted a workshop with law enforcement agencies from Tanzania and South Africa. The workshop spanned two days in Dar es Salaam and involved many fruitful roundtable discussions regarding port and customs operations as well as potentially useful search strategies for the rats to employ. The aim of the workshop was to demonstrate the potential of these rats for detecting wildlife contraband by sharing proof-of-principle results of the rats detecting both pangolin and hardwood, while providing a collaborative environment for brainstorming implementation avenues and feasibility. 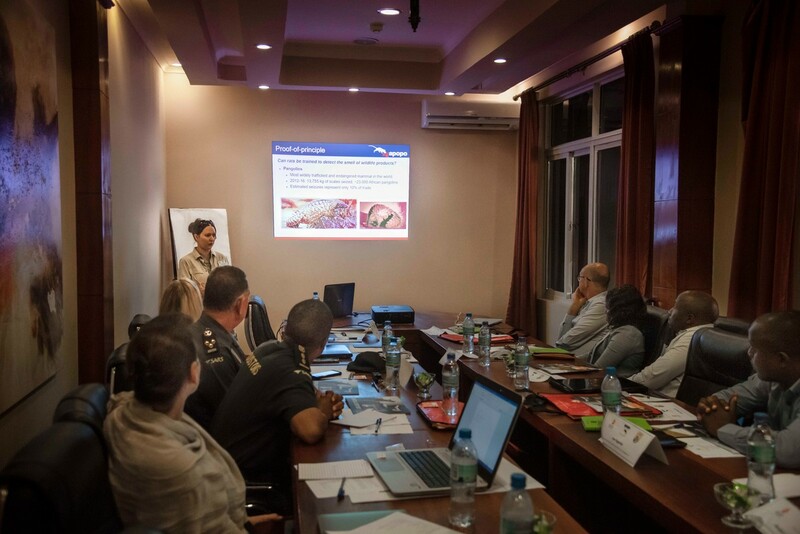 As an important feature of this objective, roundtable discussions were held regarding the viability of utilizing the detection rats to sniff out wildlife contraband in busy shipping ports as primary points of entry and exit using various methods. UK Department for Environment, Food, and Rural Affairs (DEFRA) Illegal Wildlife Trade Challenge and Endangered wildlife trust.